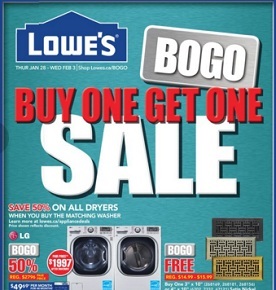 Featured offers in this Lowe’s Canada flyer: $1997.00 LG 5.2 Cu. Ft. Front Load High-Efficiency Washer and 7.4 Cu. Ft. Large Capacity Steam Dryer; $14.99 – $15.99 3″ x 10″ or 4″ x 10″ Satin Nickel, Oiled Bronze or Antique Brass Wicker; $35.97 Para Lifestyles 3.70L Lifestyles Interior Flat; $21.99 20Kg Alaskan Ice Melter; $79.99 Irwin 2-Pack 10″ Mitre/Table Saw Blades; $64.99 AquaSource Bath Faucet; $44.99 First Alert Battery Powered Combo Smoke and Carbon Monoxide Alarm; $8.49 Sheet of 1/2″ 4′ x 8′ Light and Strong Drywall; $1.29 – $69.99 Cabinet Knob or Handle; $19.99 – $54.99 Drapery Panel or Decorative Drapery Rod; $4.49 per sq. ft. Monarch 5-1/8″ x 9/16″ Brushed Cream Bamboo Solid Hardwood Flooring; $1.99 per sq. ft. Style Selections 12″ x 12″ Floriana Heather Porcelain Tile; $24.99 20″ Ergo Polycarb Scoop; $259.00 3/4 HP MyQ Belt Drive Garage Door Opener; $59.99 Internet Gateway; $99.00 48″ Wide Shelf; $259.00 4.6 Cu. Ft. Stainless Steel Mini Refrigerator; $1299.00 29″ Briggs & Stratton Two-Stage Gas Snow Blower; $89.99 Hilton Wall Sconce/ Bathroom Light; $59.99 Allen + Roth Valleymede Aged Bronze Glass Jar Pendant; and more. Find all deals and offers in the latest Lowe’s flyer for your local store.